What causes traumatized children and families to get stuck and unable to move forward? How can we change the outcome of impossible cases? This initially successful case became impossibly stuck. The daughter relapsed. The husband gave up and stopped coming to sessions. The mother lost confidence in the treatment approach and terminated therapy prematurely. This treatment failure, called The Uncorked Bottle, is discussed in detail within the preface of our latest book, Treating the Traumatized Child: A Step-by-Step Family Systems Approach. I know I’m not alone. I often hear in my workshops and webinars that impossible trauma cases are commonplace and challenge even the most experienced trauma therapists. After eight years of research in 15 states with more than 1,000 families, we developed the FST | Family Systems Trauma Model to provide step-by-step tools to help therapists heal families with trauma. The research and book produced over 18 Core Techniques. The core technique that helped the therapist get unstuck with complex trauma cases was the FST Technique of “Undercurrents”. Methods to work with clients in replacing unhealthy undercurrents with their healthy undercurrent counterparts. Table 1 is an excerpt example from the full table of undercurrents techniques in Chapter 8 of Treating the Traumatized Child: A Step-by-Step Family Systems Approach. For example, if a traumatized adolescent shows symptoms of self-harm or cutting, the inability to heal may be directly traced to the unhealthy undercurrent of unresolved grief and abandonment brought on by a bitter divorce or the loss of a father who moved away. In this example, a technique like a memory scrapbook can illicit the healthy undercurrents of grief education and resolution. Without the infusion of these healthy undercurrents, the case remains stuck or impossible. We discovered implementing the Undercurrents Technique was analogous to weed work vs. root work. The weeds, in the above example, might be psychotropic medication such as anti-depressants or behavioral modification to lessen the self-harm symptoms. These interventions may provide temporary relief, stabilization, or maintenance but keep the case stuck in first-order change. In some cases, first-order change is good enough, appropriate, and all that the therapist can expect. The undercurrents, on the other hand, represent the roots or main drivers of the symptoms. Like roots underneath the soil, they are initially unseen to the naked eye. Once uncovered, they can bring about permanent healing or second-order change. Undercurrents are the Rosetta Stone or compass to unstick impossible cases. When mental health practitioners work with families to identify the root Unhealthy Undercurrents, families quickly move from feelings of impossibility to hope and healing. The process provides a self-discovery journey that eliminates blame and places focus on addressing the hidden sources of pain. The core FST technique of the “seed/tree diagram” will illustrate how this self-discovery process takes place and can be found in Chapter 5 of Treating the Traumatized Child: A Step-by-Step Family Systems Approach. 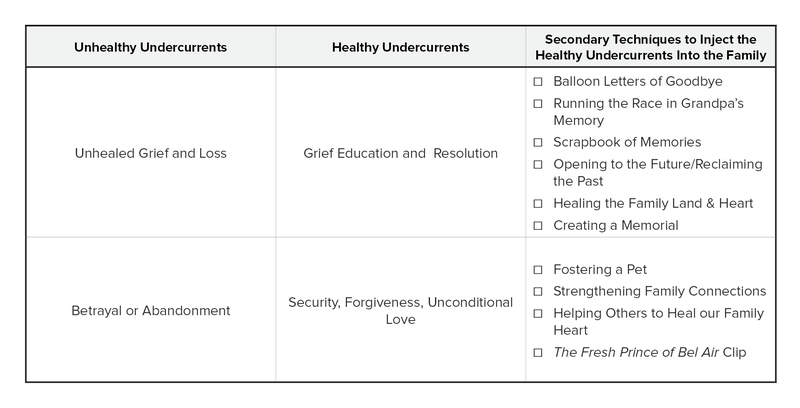 With Alison’s family, Table 2 illustrates that the first unhealthy undercurrent would be “family secrets” and it the second (not listed) the “betrayal and abandonment” of the father. Next, I would have countered the “family secret” unhealthy undercurrent with its healthy undercurrent counterpart of “revealing family secrets” using the technique of difficult conversations. (This technique is outlined in Chapter 8 of “Treating the Traumatized Child.”). A version of this strategy did occur when I asked the mother to recount the sexual abuse story. However, what I failed to do was have the mom talk about the abuse with her husband or Alison. The reason was my fear and my lack of FST training. I did not yet possess the tools or technique of undercurrents to conduct the needed high-level family and marital therapy that this case demanded. However, the biggest key missing unhealthy undercurrent that was never addressed was “betrayal and abandonment” the mother must have felt with the father that sexually abused her and the mother that did nothing. This was further exacerbated when Mary’s (Alison’s mom) husband John was emotionally distant during Alison’s two years of problems. Looking back, the healthy undercurrent of forgiveness was never brought up or connected to the “now what?” question that the mother asked to heal the trauma of the abuse in the here and now. Without the undercurrent technique, there was no compass or roadmap for me to follow. I remained in the weeds and the case remained impossible with premature termination. A Trauma Playbook would have outlined actions each family member could take to show forgiveness and heal the intergenerational trauma of abuse that affected the entire family.